Thank you for your interest in starting a new business in St. Johns County! The County's Economic Development Office, St. Johns County Chamber of Commerce, and other resource partners coordinate efforts to support your small business. 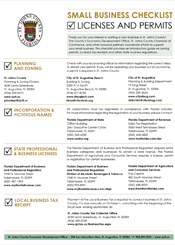 The St. Johns County Small Business Checklist provides an introductory guide on zoning permits, business tax receipts and other state business regulations.